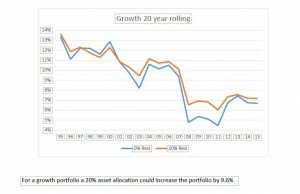 Asset allocation is the most critical factor in wealth management, and in reality, it involves not just one decision, but a series of decisions. It’s also typically sold as a simple share-vs-bonds split, but we believe there is much more to it than that if you want an effective result for your investor clients. 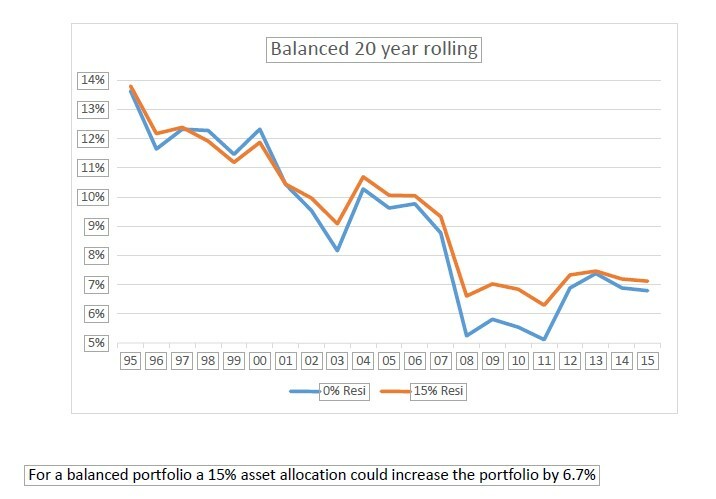 The step many people overlook in considering asset allocation is ensuring that they are clear about their goals. If your investor clients already have a nest egg and are close to retirement, their approach is going to be more conservative than if their goal is total return. 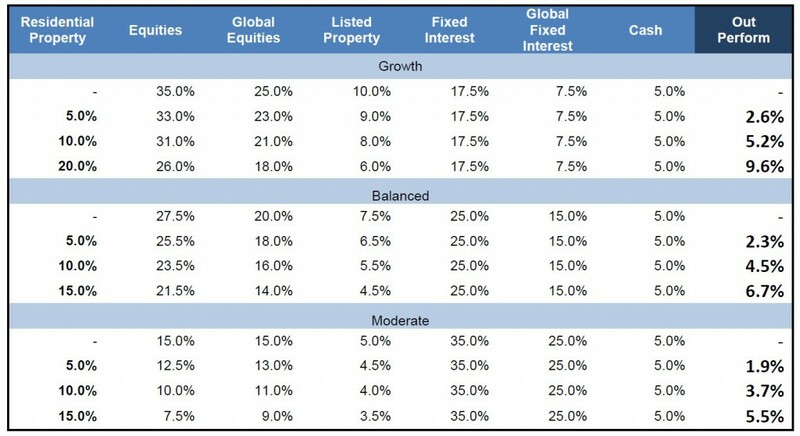 Atchison Consultants have released a report on property asset allocation recently that shows a rolling 20-year return on residential property in three different risk categories; Moderate, Balanced and Growth. 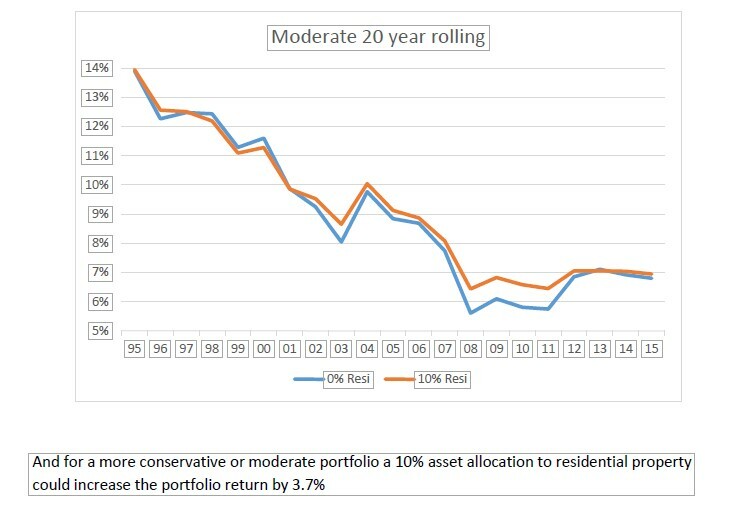 Taking an average asset allocation across domestic and international shares, fixed interest and cash as generally applied to a Moderate, Balanced and Growth portfolios as a base, Atchison’s research suggests that returns on a growth portfolio can be enhanced by up to 9.6% by including 20% asset allocation in residential property. 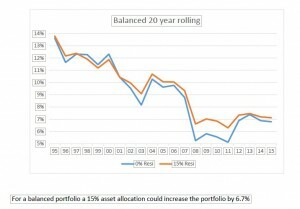 The asset allocation breakdown for each of the above-mentioned portfolios is based on the asset allocation of a typical portfolio of a similar nature as applied in the industry. And the residential return figures are calculated out of the Real Estate Institute of Australia (REIA) Housing Index produced by Atchison Consultants. The index is constructed based on the houses and units prices across all Australian states and territories weighted by population. 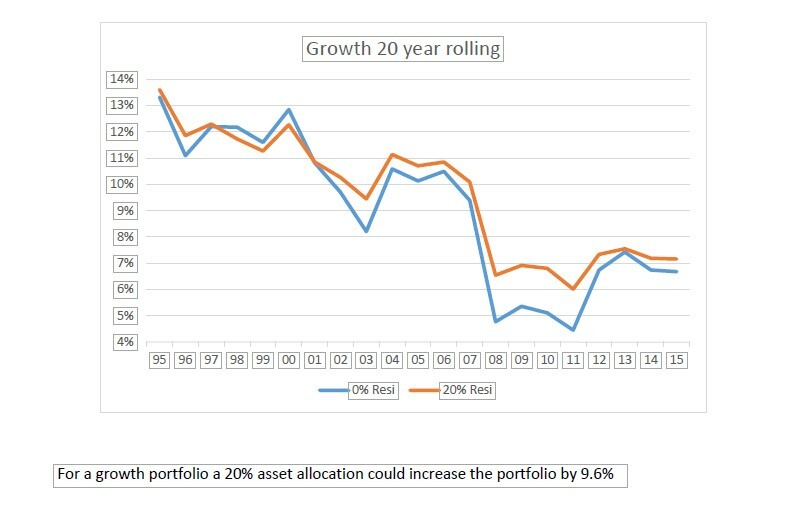 Since the industry average allocation in direct property is very limited, being 3.8% in Growth portfolio, 3.0% in Balance portfolio and 2.9% in Moderate portfolio, a 20%, 15% and 10% residential property allocation respectively will result in the proportional decrease in the allocation of other asset classes. However, it is likely that the relatively low volatility of residential property provides a stable anchor to the above-mentioned portfolio types. Residential property as an inclusive strategy for Moderate, Balanced and Growth portfolio types can enhance the return over the longer term. Good Class Bungalows, at one third of local prices! Good class bungalows, more commonly known as GCBs, are considered the most exclusive residential properties and desirable investments in Singapore. So what is the profile of a Singapore GCB? Singapore GCB Price per square foot is around S$1,500 for the top ten GCB properties sold in 2014. The prices of the top ten Singapore GCB sold in 2014 had an average GCB value of S$1,500 square foot. What would a GCB look like in Melbourne? There are a few sought after Melbourne suburbs with iconic family mansions that aligned to the Singapore GCB Profile. These are often leafy green suburbs with wide roads, some built for horse and carriage in the Victorian era of 1890s. Some of these suburbs include: Brighton 3166, Kew 3101, Canterbury 3126, Toorak 3142, Armadale and Malvern. A selection of twelve landed houses ranging from 1,200 square meters to 2,900 square meters were identified in these Melbourne suburbs. The average land size and price of this sample of 12 properties was 1,827 sq meters and sale price of AU$7.8million, that is AU$476 per square foot. 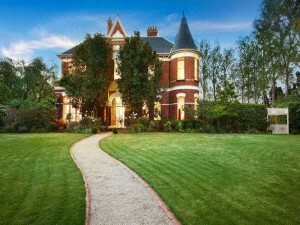 The lowest sale price was AU$4.9 million and the highest sale price was AU$11.7m. The Melbourne GCB average price per square foot for AU$476 which compares to the average price of the top ten Singapore GCB sold in 2014 of S$1,500 square foot. So buying a Melbourne GCB with land over 1,400sq meters is around one third of the price of a Singaporean GCB. The Australian Foreign Investment Review Board (FIRB), restricts non-resident foreign investors to new/off the plan properties. So direct foreign ownership of an Australian GCB or established iconic property like a penthouse, even via a company structure, is not allowed just like in Singapore. DomaCom Platform allows for Fractional Investment in all Property Asset Classes. The DomaCom Platform enables fractional investing from 1% to 100% of a property in a segregated sub-fund. DomaCom is a widely held collective investment scheme and so is able to buy Australian established and iconic GCB and penthouses. So via the DomaCom platform, you could buy 1% to 100% of the units of a sub-fund that holds a Melbourne CGB! For illustrative purposes, Woolworths in Orange, NSW is an example of a commercial property that you could look to crowdfund in the DomaCom platform. Inclusive of a long term lease to Woolworths Ltd until 2034, this immaculately presented property offers a rare opportunity for astute investors to purchase a freestanding Woolworths supermarket with a rare net lease, ensuring the Lessee pays for all statutory and operating outgoing expenses. A diverse range of industries including healthcare, mining, agriculture, retail and education results in attractive demographics with 15.9% of Households earning a high income compared with 11.3% average for regional New South Wales, and with an unemployment rate of only 4.4% it is sitting well below the Regional NSW rate of 6.1% (Source: ABS 2011 census). Located a short distance from Orange Train Station, 100 metres from the Mitchell Highway and surrounded by an expansive on-grade council car park, the property provides a high level of connectivity to the local community and ease of access for patrons. DomaCom has begun working with property adviser, Empower Wealth, to provide a variety of investment models via their Property Wealth Planning Simulator. Empower Wealth will offer Growth, Yield, Balanced and Mixed property portfolio models each containing multiple properties to provide diversification. With 5 and 10 year holding terms and ‘if sold’ projections based on no debt property purchases, advisers can provide an asset allocation solution with minimal risk and diversification. A geared model will also become available as DomaCom finalises a lending solution for the platform. The Simulator model will be available to all DomaCom accredited advisers along with client presentation material. 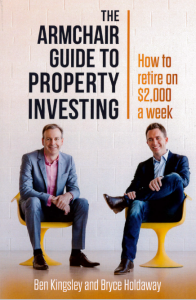 Their book, The Armchair Guide to Property Investing, is also free to DomaCom Accredited Advisers who wish to integrate property into their client advice model. 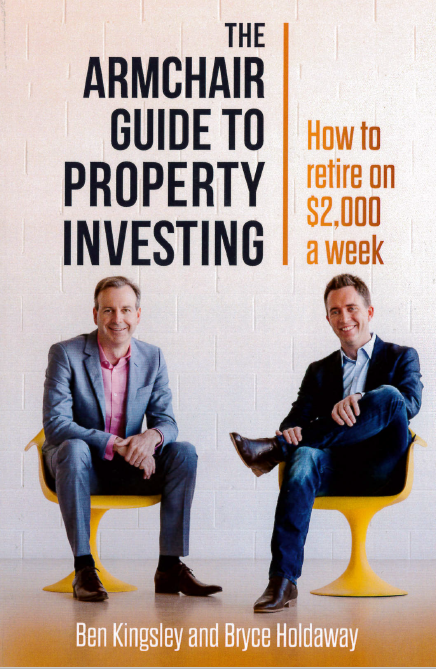 Please email Paul Zaman, Managing Director of DomaCom Singapore at paul.zaman@domacom.com.au for your copy. Often getting started in investments is difficult, because the question of where and when to start is often an inhibition. DomaCom can offer on its platform a portfolio of properties. This option can be selected by yourself and your advisor with help from Australian property investment experts like Empower Wealth. For example, two popular commercial asset classes are Student Accommodation and Serviced Hotel rooms. 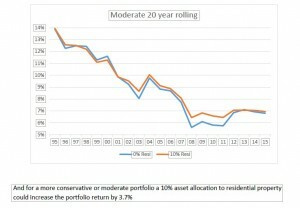 Here are two illustrative diversified portfolios. Your Wealth Manager can help you, in asset allocation, and identify the split of investment funds that should be in high income and low risk. Plus, they can advise you on the unique risk and performance profile of Australian real property. DISCLAIMER: DomaCom Australia Ltd ABN 33 153 951 770 and holder of AFSL No 444365 is authorised to provide general financial product advice in Australia. Whilst DomaCom has taken all reasonable care to produce the information in this material, it does not make any representations in respect of, or warrant the accuracy, timeliness or completeness of any of the information. The information provided in this material is general information only. It does not constitute financial, tax or legal advice or a forecast. DomaCom Singapore Private Limited is not authorised to provide advice. This information is strictly for distribution to Singapore licensed financial advisors, wealth managers or private wealth bankers only.